After stumbling into a school for witches, a bumbling heroine comes to realize that she just might belong there. Based on Jill Murphy's beloved books. Selection Day: When a broomstick crash-lands on her balcony, Mildred Hubble hitches a ride to Cackle's Academy and begins her training as a newly minted witch. Tabby: It's time for the first-years to choose their feline familiars. But fear of flying makes Mildred's cat, Tabby, a terrible co-pilot. New Girl: When a celebrity student arrives in rockstar fashion and takes a shine to Mildred, Ethel uses the girls' budding friendship to make Maud jealous. Pond Life: When a spell gone wrong turns Ethel into a pig, she retaliates by turning Mildred into a frog, and Maud and Enid must work together to find her. The Great Wizard's Visit: The school's abuzz with excitement when the Great Wizard makes an impromptu visit and Miss Cackle taps Mildred to lead an aerial display. The Best Teacher: Mildred's plan to ace a history test backfires when a wisdom spell turns her into an old woman and forces her to impersonate a teacher. Maud's Big Mistake: A panicked Maud uses a forgetting powder on Parents' Evening so no one will remember her mistakes. But now Mildred has forgotten their friendship. The First Witch: When invitations go out for the first-year coven, Mildred's not sure she belongs ... until a hair-raising development helps change her mind. Spelling Bee: A competitive Miss Hardbroom plays hardball when a rival school comes to Cackle's Academy to compete in the Annual Spelling Bee. The Mists of Time: When heavy mist puts the school on lockdown, Mildred and Ethel sneak out to find a lost cat, only to find the academy much altered upon their return. Out of Bounds: While the other first-years focus on end-of-year exams, Ethel is desperate to learn the truth about Mildred, Miss Cackle and a shocking school secret. The Worst Headmistress: With a horrible new headmistress at the helm, the academy takes on a much darker tone. Is the "worst" witch the school's best chance for salvation? Wanting your storied institutions to be great again is a cautionary theme for 2017, and it is heartening to see a rare children’s series so expertly push back against class stratification and xenophobia. 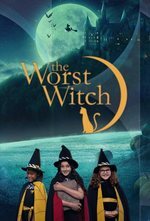 The Worst Witch is, essentially, a story aimed at bookish young women that deals with imposter syndrome. I haven't finished watching the whole season yet. I saw a comment about another show which seemed like it ought to have been all about women, but wasn't, and remembered that Worst Witch took over two episodes to give even one man a speaking role. (I'm not even sure they were in the background.) This show's nearly entirely about girls and women. It's definitely a kids' show and the Lessons about Friendship may be better in small doses, but if you want a nice cheery pick-me-up, Worst Witch is fun and good. I missed reading the books or watching any of the other movie or TV adaptations growing up, so this is new to me. Bella Ramsey, the Tiniest Mormont, is delightful and does comedy as well as she does sterner-than-Ned-Stark in Game of Thrones. The rest of the cast is pretty great, too. Not sure how much there is to discuss with this one, but I figured it's worth pointing out a source of not-very-demanding pleasantness. The Worst Witch goes well with breakfast cereal. So how does this compare to Little Witch Academia? Not sure, haven't seen it! Might have to give it a go to compare. I didn't even realize that was Bella Ramsey! At least in that I didn't even think about it! This was cute and fun and while there are some rivalries and such, I appreciate it was more about girls supporting each other and being friends. I also appreciated the girls and women dominated the cast -- there are some men (and more as the series continues) but they're not the focus. It's a fun Sunday binge watch. Binged it with my kids a while ago. Bella Ramsey IS really good, the GoT casting director who found her obviously has a great eye. Finally got around to watching the last couple of episodes! Aw, heartwarming. Also I loved Mildred's DDR-induced burst of uncontrolled magic, or whatever that was. The gender politics of the magical world are kinda questionable what with the Great Wizard being able to rewrite the Witches' Code unilaterally, but he is commendably willing to fade into the background when he's no longer needed. If Mildred's not powerful enough yet, and the Great Wizard doesn't fear the magic of middle-aged witches, but second-hand teenage witch power defeats him and Miss Hardbroom manages to free Miss Cackle with some effort, what's our bell curve on witch power vs. age? Looks like it's not a Young Wizards-style younger-is-more-powerful thing, nor are the oldest necessarily the most powerful (hi, Granny Weatherwax.) Probably I should read the books sometime? Or repeat to myself that it's just a show, etc. I could've used a bit more Ethel time as she realized she's relying on the rule she was just complaining about to get revenge/power/wacky hijinks. The sister-hug at the end was good and Esme is a good (if not the most cunning) big sister.